Crow’s Nest Trading Co, online at CrowsNestTrading.com offers furniture and apparel for western and southwestern lifestyles. Offering a wide range of rustic furniture and home accessories including rugs, pillows, and bedding, Crow’s Next Trading has everything you’ll need to get your home into the southwest spirit. Bring out your inner cowgirl (or boy) with a variety of women’s cowgirl fashion and men’s cowboy shirts. Check out their Cowboy Christmas collection for your Holiday needs. Stop by RetailSteal.com before you buy to save with Crow’s Next Trading coupons, Crow’s Next Trading discounts, and Crow’s Nest Trading promotions. Crow’s Nest Trading Co ships via FedEx Ground or Priority to the Continental US for as low as $4.95. Large items and international shipping require additional charges. If dissatisfied with your purchase, return item within 30 days of receipt. Check website for full details and information on exclusions. Use this code to get 10% off your order of $150 or more at Crow's Nest Trading Co. Click link to shop. Save up to 30% on clearance items at Crow's Nest Trading Co. Click link to shop. 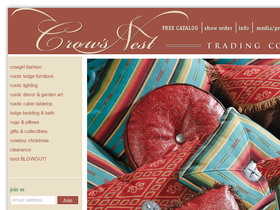 Visit Crow's Nest Trading Co. and order a free catalog. Click link now to start. Find accessories for as low as $8 at Crow's Nest Trading Co. Click link to shop and save. Use our coupon code at Boot Barn online today when you make your first purchase and enjoy a 10% discount. Shop at Boot Barn and enjoy a free Wrangler Backpack with any purchase. Click here to shop. Shop at Boot Barn and enjoy free shipping on orders $75+. Click here to shop. Spend $74.99 or more at BootBarn.com and enjoy free shipping. Click here to shop and save today. At Boot Barn, get up to $30 off boots. Click link to go shopping online.